The attendance this week was down to 7 people, I don't know whether this was due to the forecast snow fall or masochistic football fans staying in to see England play Spain. The early part of the session was spent dishing out the long delayed (due to my keeping forgetting to order) T-shirts, which were brought along by Mike. He will not be along next week, but I have the shirts for those who have ordered but not yet picked theirs up. 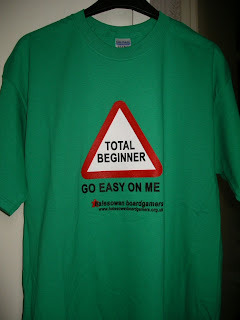 The cost to members who have ordered is £2 per shirt. See below the wonderful design by Luke (this one's mine and is of course green). A second outing for this one, which seems to be going down well with those who have tried it, so it's nice that we finally have an English release. Steve won by producing a lot of films, while I only produced 3 which were able to net me 3 of the 5 major awards at the end of the game. Kamil missed out by only having 3 films but missing out on the end of game awards. This is an interesting tile laying game, pictured right. Basically you are a God creating and modifying a world by playing triangular tiles. 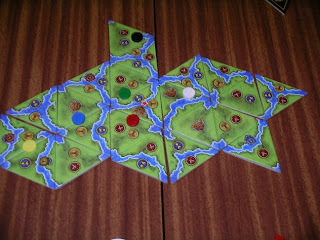 There are potentially 6 tribes in different colours and on your turn you place a tile (either directly on the table or on top of an existing tile replacing it) and then if you have created a new continent or there is an existing vacant continent you may bring a new tribe (if available) on to the board, at the same taking follower cubes (of which there are 5 of each colour) equal to the number of corn symbols on the continent or alternatively taking a follower of any tribe already on the board. Following this you take a new tile to complete your turn by drawing a new tile to make your hand back up to 2. You can trigger scoring for yourself on any turn by playing one of your 3 scoring discs at which time, for each follower you have you score 1 point for each cup symbol on the continent occupied by that colour, so in the picture (click for a larger view) Red followers score 5 points. In addition if an epoch tile is drawn each player scores 1 point for each follower for each pyramid that that tribe had on their continent, so in the picture each red scores 2 points. In addition points are scored by playing tiles with temples yielding points for the number of symbols corresponding to the temple on the continent that it appears on. The interesting part of the game occurs when tiles are played causing continents to be split in which case any existing tribe migrates to the land having most corn symbols, or tiles are played combing continents in which case if there is more than 1 tribe on the new continent they come into conflict and the tribe with least weapons symbols on their side of the new continent is eliminated resulting in it being removed from the board with all followers being lost. It can be brought back later. To play a tile causing migration or conflict costs a follower of any colour but you can of course take it back as your action at the end of the turn. The game ends when either the seventh epoch tile is played or all player scoring discs have been played. All in all an interesting game that I'd like to play again although I think we took far too long thinking about it resulting in a rather protracted game. This may also have something to do with the a marked delay in the appearance of epoch tiles and also because I was a bit distracted at one point trying to sort out the T-shirt money. A periodic outing for this one, looks like Mike had a good win. A longer than average San Juan and a second win in a row for Gordon. Looks like a low scoring game, maybe a shortage of '6' buildings. I finished with 6 province tiles and Mike had 5. Mike’s commodities matched up a little nicer than mine did and he had the benefit of the princess card for a few rounds. Steve did the hard job of working up connections but the order the tiles came out did not help him. Richard was rubbish. I have not gone through all the records but I think this was the lowest scoring game we have ever had. Richard finished with a Guild Hall, I got a Palace and I think Mike did not get any 6 buildings. I got down a building or 2 more than the others.